ANNAN Athletic is one of the only clubs in Scotland to voice their support for adopting strict liability to deal with fan behaviour. The measure would mean that clubs would be held liable for the actions of their supporters. But in a poll of Scotland’s 42 senior clubs carried out this week by the BBC, only three clubs – Annan Athletic, Queen of the South and Partick Thistle – said they would support a move to introduce strict liability in the SPFL. 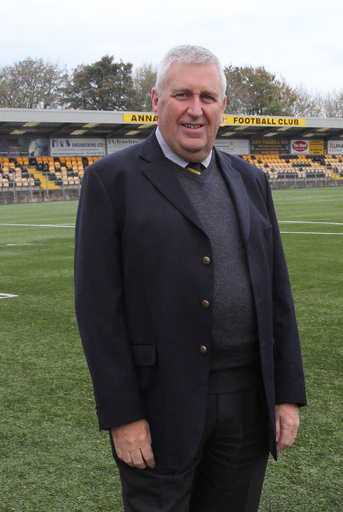 Speaking about his club’s support for the policy, Annan Athletic chairman Philip Jones (pictured) said: “We have a licence to operate our premises, and if there is a problem we should be accountable. The strict liability rule already applies to UEFA matches but is not yet used in Scottish domestic games. It would see clubs held liable for inappropriate behaviour by their supporters, including pitch invasions, the throwing of objects, the use of inappropriate gestures, words or objects or the lighting of fireworks. Clubs could be forced to play matches behind closed doors, close sections of their ground or pay expensive fines. The issue is being discussed following a number of incidents in recent weeks where objects have been thrown onto the pitch and players have been subjected to racist or sectarian abuse. In the BBC poll, 14 clubs said they were against strict liability and 17 were not willing to comment. Eight clubs, including top flight teams Celtic and Rangers, did not respond to the BBC survey. Philip continued: “I was disappointed by the number of clubs that gave no comment or did not respond. “I realise it is more of a problem for bigger clubs – when you are dealing with 50,000 fans you cannot interact with everyone – but if everyone made some effort it would help things. Clubs who oppose strict liability say they could be doing everything in their power to work with fans and still be held responsible for the actions of one individual. But Philip said: “You have got to tackle these problems head on. “We are fortunate that we do not have a lot of problems, but we work hard and put the effort in to make sure everything is safe. “We work with our fans and we have a good relationship with the local police which really helps. “If the clubs cannot get a grip on it then the Scottish Government will get involved.